Sailing is an incredible pursuit – it lets you get outdoors, be active and enjoy the fresh sea air. Beyond that the feeling of sailing along at fast speeds can be truly exhilarating. You cannot, however, enjoy this great pursuit without some lessons. Sailing is largely intuitive yet there are some basic things which are important to know. This includes learning about points of sail, how to trim sails, marine weather, navigation and some basic safety and first aid knowledge. Beyond that it is crucial to get some expert advice as this sport is largely about touch and feel, and you need some time on a boat to get a true sense of sailing. We will give you ample time behind the wheel so you can learn the intricacies of this amazing sport. 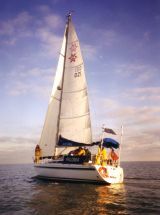 The East Coast of England is the ideal place for sailing lessons and the Crouch Sailing School is one of the UK’s most experienced sailing schools. We will teach you the very basics, and quickly develop your skills to the point where you are a competent and knowledgeable sailor. Best of all these courses are fun – sailing is a very social sport and we believe that it is important to have a good time with the other people on the yacht. We hope you will leave our course with a great skill set and a collection of fond memories.